This guide is for the Wii and PlayStation 2 versions. 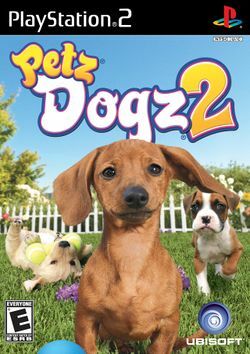 For other versions, see Petz: Dogz 2 (Nintendo DS), Petz: Catz 2 (Nintendo DS) or the PC version. Petz: Dogz 2 (わんこと魔法のぼうし, Wanko to Mahou no Boushi?) and Petz: Catz 2 (にゃんこと魔法のぼうし, Nyanko to Mahou no Boushi?) are adventure games for the PS2 and Wii, although there are virtual pet versions for the PC and Nintendo DS. In this game you are a dog or cat (depending on which game you have), and you can choose your character from 40 breeds and then accessorize with different clothing. Both games are exactly the same, but with the obvious difference that you are a dog in Dogz and a cat in Catz. The UK versions are just called Dogz and Catz. In the game, you live on an island entirely populated by dogs or cats, one of the reasons why this game is similar to The Dog Island. The main storyline is that you and your friend are tricked into giving a Magic Hat, which is used to keep peace on the island, to an evil wolf named Ivlet. He uses it to destroy the island, also turning all animals evil and destroying many of the buildings. Your goal is to repair all the damage he has done, by helping out all the troubled dogs or cats, and finally defeating Ivlet and getting the Magic Hat back. There are also minigames you can play, first with wild animals that have escaped from the Zoo, and then by selecting them from the Minigames menu. From the menu the minigames can also be played in two-player mode. Cover art for the cat version. This page was last edited on 29 July 2014, at 18:13.